↑ Cesc Fabregas profile 互聯網檔案館嘅歸檔，歸檔日期2008年12月10號，., msnsport.skysports.com, accessed 5 April 2008. ↑ 2.0 2.1 2.2 2.3 2.4 Francesc Fabregas profile, soccernet.espn.go.com, accessed 25 7月 2007. ↑ 3.0 3.1 3.2 Cesc Fàbregas profile, arsenal.com, accessed 22 May 2007. ↑ Football: The Interview Francesc Fabregas - Spanish marvel blossoms , findarticles.com, 查閱 22 6月 2008. ↑ 5.0 5.1 5.2 Cesc Fabregas, uefa.com, accessed 23 5月 2007. ↑ 6.0 6.1 6.2 The Young Gunner, thefa.com, 19 5月 2005, accessed 24 5月 2007. ↑ 7.0 7.1 7.2 7.3 Marcotti, Gabriele and Balague, Guillem, "From Barcelona to Barnet: how a rising star learnt his trade", timesonline.co.uk, 28 2月 2007, accessed 23 5月 2007. ↑ Cesc Fabregas becomes Arsenal's youngest ever player, arsenal.com, 27 1月 2006, accessed 22 5月 2007. ↑ Arsenal youngsters thump Wolves, news.bbc.co.uk, 2 12月 2003, accessed 22 5月 2007. ↑ Record Scorelines, arsenal.com, accessed 23 5月 2007. ↑ 11.0 11.1 11.2 11.3 11.4 11.5 11.6 Francesc Fabregas history, soccernet.espn.go.com, accessed 18 December 2007. ↑ Hughes, Ian, "Fabregas the fabulous", news.bbc.co.uk, 27 8月 2004, accessed 22 5月 2007. ↑ Arsenal 3-0 Blackburn, soccernet.espn.go.com, 25 8月 2004, accessed 23 5月 2007. ↑ Haylett, Trevor, "Awesome Arsenal progress in style, uefa.com, 7 12月 2004, accessed 22 5月 2007. ↑ Arsenal 0-0 Man Utd (aet), news.bbc.co.uk, 21 May 2005, accessed 23 5月 2007. ↑ 16.0 16.1 16.2 Hubbard, Norman, "Arsenal's midfield muddle", soccernet.espn.go.com, 22 August 2005, accessed 23 5月 2007. 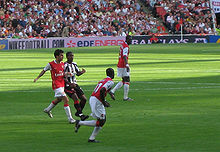 ↑ 17.0 17.1 Arsenal 2-0 Juventus, news.bbc.co.uk, 28 3月 2006, accessed 23 5月 2007. ↑ Sheringham, Sam, "Spain Teenager Fabregas Sparks World Cup Rally, Wows Maradona", bloomberg.com, 20 June 2006, accessed 23 May 2007. ↑ 19.0 19.1 19.2 Harrold, Michael, "Fabregas plots Arsenal revival", uefa.com, 13 4月 2007, accessed 23 5月 2007. ↑ Haslam, Andrew, "Barca comeback denies Arsenal", uefa.com, 17 May 2006, accessed 23 5月 2007. ↑ Kendall, Mark, "Real confident of securing Cesc's signature", msn.skysports.com, 4 July 2006, accessed 22 5月 2007. ↑ Wenger: Fàbregas is not for sale, he is Arsenal's future, arsenal.com, 12 July 2006, accessed 22 5月 2007. ↑ Fàbregas signs new Arsenal deal, news.bbc.co.uk, 19 October 2006, accessed 22 5月 2007. 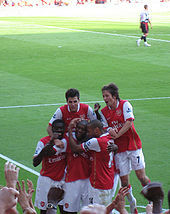 ↑ Harris, Chris, "Fabregas - Our style of play makes me so happy", arsenal.com, 22 October 2006, accessed 23 5月 2007. ↑ Adams, Tom, "Cesc staying grounded", skysports.com, 27 October 2006, accessed 24 5月 2007. ↑ Chelsea 2-1 Arsenal, news.bbc.co.uk, 21 February 2007, accessed 23 5月 2007. ↑ 27.0 27.1 Arsenal are the ultimate 'second half' team, arsenal.com, accessed 23 5月 2007. ↑ Dinamo Zagreb 0-3 Arsenal, news.bbc.co.uk, 8 June 2006, accessed 7 9月 2008. ↑ Lipton, Martin, "HE'S FAB IN POLL", mirror.co.uk, 2 December 2006, accessed 22 5月 2007. ↑ Your Team of 2006 revealed, uefa.com, 19 January 2006, accessed 22 5月 2007. ↑ Benitez and Fabregas scoop awards, news.bbc.co.uk, 9 February 2007, accessed 22 5月 2007. ↑ Arsenal 3-1 Man City: Fabregas inspires revival, soccernet.espn.go.com, 17 April 2007, accessed 18 4月 2007. ↑ 33.0 33.1 'He showed he is the ultimate midfield player', arsenal.com, accessed 28 6月 2007. ↑ Wenger signs new three-year Gunners deal, soccernet.espn.go.com, 7 9月 2007, accessed 16 September 2007. ↑ 35.0 35.1 How Fabregas plans to save Arsenal, football.guardian.co.uk, 25 August 2007, accessed 17 9月 2007. ↑ Burying the ghost of Henry. soccernet.espn.go.com, 15 September 2007, accessed 17 9月 2007. ↑ Fabregas scoops O2 Player of the Month award, arsenal.com, 5 October 2007, accessed 6 10月 2007. ↑ GUNNERS DUO CELEBRATE AWARDS DOUBLE, premierleague.com, 19 October 2007, accessed 5 3月 2008. ↑ AC Milan 0 - Arsenal 2, news.bbc.co.uk, 5 3月 2008, accessed 5 3月 2008. ↑ Ronaldo heads shortlist for players' awards, soccernet.espn.go.com, 11 4月 2008, accessed 12 4月 2008. ↑ Ronaldo named player of the year, news.bbc.co.uk, 27 4月 2008, accessed 28 4月 2008. ↑ Season Review Week: The highlights and the lowlights, arsenal.com, accessed 24 5月 2008. ↑ Brazil roar past brave Spain, Argentina take third, fifa.com, 30 August 2003, accessed 23 5月 2007. ↑ 44.0 44.1 Haslam, Andrew, "2004: Cesc Fabregas", uefa.com, accessed 9 7月 2008. ↑ 45.0 45.1 Harris, Chris, "Fabregas - Why I feel part of the Spain 'family'", arsenal.com, 28 March 2007, accessed 24 5月 2007. ↑ Ivory Coast suffer defeat, news.bbc.co.uk, 2 March 2006, accessed 23 5月 2007. ↑ Spain 3-1 Tunisia, news.bbc.co.uk, 19 June 2006, accessed 23 5月 2007. ↑ Saudi Arabia 0-1 Spain, news.bbc.co.uk, 23 June 2006, accessed 23 5月 2007. ↑ Spain 1-3 France, news.bbc.co.uk, 27 June 2006, accessed 23 5月 2007. ↑ Spain 4-0 Ukraine, news.bbc.co.uk, 14 June 2006, accessed 22 May 2007. ↑ Germany's Podolski named top young player, cbc.ca, 7 July 2006, accessed 22 5月 2007. ↑ Veysey, Wayne, "Cesc Fabregas ready to talk tough with Arsenal", telegraph.co.uk, 28 5月 2008, accessed 10 6月 2008. ↑ 53.0 53.1 53.2 Cesc in Euro 2008 Team of the Tournament, arsenal.com, accessed 6 8月 2008. ↑ Spain beat Italy in penalty shootout 互聯網檔案館嘅歸檔，歸檔日期2008年6月26號，., soccernet-akamai.espn.go.com, 22 6月 2008, accessed 23 6月 2008. ↑ Germany 0-1 Spain: Torres ends Spain's pain, soccernet.espn.go.com, 30 6月 2008, accessed 30 6月 2008. ↑ 56.0 56.1 Smith, Alan, "Fabregas puts his skates on in chase for perfection", telegraph.co.uk, 20 January 2007, accessed 23 5月 2007. ↑ McIlvanney, Hugh, "Fàbregas a leader in waiting", timesonline.co.uk, 26 March 2006, accessed 22 5月 2007. ↑ Townsend, Nick, "Spanish marvel blossoms", The Independent on Sunday, 2 October 2005, accessed 17 9月 2007. ↑ Macintosh, Iain, "Completely Fab", The New Paper, 29 9月 2007. ↑ Wenger: Fabregas has the vision of Platini, arsenal.com, 19 9月 2007, accessed 4 1月 2008. ↑ Wenger: 'This team is blossoming and growing', arsenal.com, 15 9月 2007, accessed 17 9月 2007. ↑ van Wijk, Jim, "Fabregas in need of rest after season of hard work" 互聯網檔案館嘅歸檔，歸檔日期2007年9月27號，., sport.independent.co.uk, 29 March 2007, accessed 24 5月 2007. ↑ Fabregas is O2/Arsenal.com Player of the Season, arsenal.com, accessed 8 July 2008. ↑ The Cesc Fàbregas Show: Nike Live 互聯網檔案館嘅歸檔，歸檔日期2008年7月4號，. nikelivefabregas.com, accessed 19 4月 2008.